We Help You Get Moving. 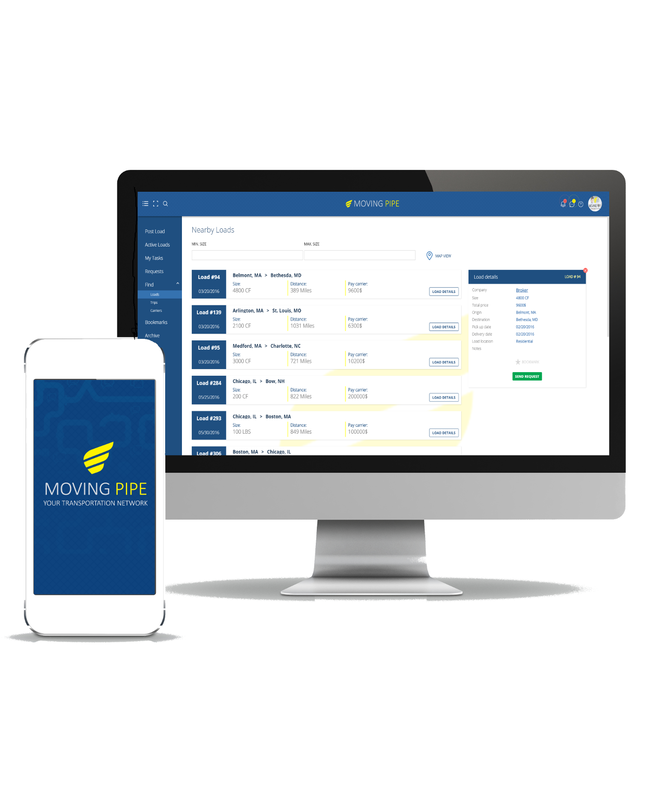 Moving Pipe is a transportation app that facilitates instant communication between companies, carriers, and brokers. This one-of-a-kind tool lets carriers publish their available space in real-time, while companies can publish goods that need transport in an instant. Our web & mobile applications are equipped with 2 distinct, easy-to-use interfaces for companies, carriers, and brokers. Moving Pipe allows business partners in the goods transportation industry to connect quickly and keep things moving. Join Moving Pipe today and start rolling your business towards success. Just fill out a quick registration form, select a suitable account that fits your type of business, and start moving your business the MP way. fill out a quick form that contains distinct information about your goods and their destination, and post it. Search for trips posted by carriers with available space. Send and receive requests from carriers looking for loads on their route. Send other companies requests to pick up their loads. Keep track of your load status and location. Communicate with your carrier partner in real-time. Create and post ‘Trip’ listing. Search for available loads near your route. Send & receive requests for loads pick-up. Manage your trip using our advanced trip management interface. Communicate with your business partners in real-time. Post & publish your loads. Send & receive requests from companies and carriers. Communicate with Companies and Carriers at any time. With Enterprise account you get all of the above with an additional set of tools to help you manage your fleet more efficiently.